From colored pencils to copic markers, distress paints to alcohol inks, all color mediums have one thing in common: they allow you to truly customize your creations. This week we celebrate all things color - and share tips and tutorials with you on our blogs as well! From Faber-Castel Gelatos to Dylusions Ink Sprays - we’ve got color! Your challenge this week is simple - use any color medium (ink, pen, mist, paint, etc) on your project this week and share with us. I (May) first created a lack of color with gesso so that I could really play with color on this springtime wall hanging. I can't tell you how much fun this piece was to make, and it is the first time I've ever done anything like it! The challenge got me thinking about creating a white base filled with texture, then using Dylusions ink sprays to color the metal Prima accents as well as the wood and chipboard bits. The real key with a piece like this is to think texture (not color), and to let it dry overnight before you attempt coloring it. Ashli couldn't wait to dive into her stash of Gelatos, Paints, and Mists for this week's challenge! Gelatos are so much fun! And, there are so many ways to use them. I must say, I haven't experimented with them enough. Time to change that! To start my canvas, I began drawing a sun ray of sorts with all of my different Gelato colors. Then, using my paint brush and a bit of water, I just started playing! One thing led to another and before I knew it, I was misting, splashing, and blending all over this little guy. To add some dimension, I melted some Beeswax and embedded a smaller canvas right into it. So much creative play! I hope you are inspired to spread your wings and let your color soar this week too! 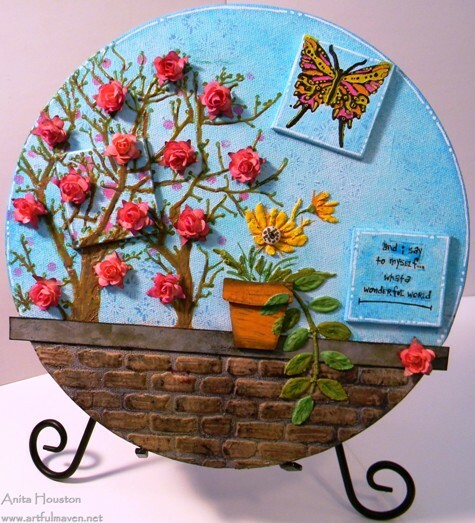 I could not wait to play with my newly acquired Tim Holtz Distress Paints! I grabbed one of my favorite colour combos: wild honey, spun sugar, mustard seed, and picked raspberry and easily applied them with my Ranger craft scraper tool! My graphic background was calling out for a modern feel accent. The flowers from these two Hero Arts clear stamp sets Lauderdale Floral and To From Petals were the perfect match.I love how white and black added to a project really make colours pop! When Suzz thinks of color she thinks of the beautiful ink sprays and mists. I started with a piece of white cardstock and started spraying different colors to get a lovely mix of colors for my background. My background is a mix of Tattered Angels Glimmer Mist Chalkboard - Teal High Heel, Inchworm, and Heidi Swapp Color Shine - Mustard. I added a fun effect with the artist tools stamped in the background using Ranger Archival Ink. I think it adds a pattern similar to bark on a tree. I do love lots of color, but I'm not always comfortable going all out there with them. So this was a great time to go all crazy with the Distress Paints. I wanted to do the swipe technique, but an art journal is not so much 'swipable'. So I used a transparency sheet and applied the paints on with some water, and started swiping away. To create a bit more interest, I used the Letter Jumble and Chequered Dots stencils and even made my own letter stencil with my Silhouette Cameo. If there was a 12 step program to help with Art color medium hoarding, Anita would need it. I wouldn't call my art color medium stash medium sized, more like extra large! However, at the current time I am obsessed with using three together, which forms a resist on base surfaces when the latter is sprayed on. Those three mediums are: Wendy Vecchi's Embossing Paste from Dreamweaver Stencils, Tim Holtz's Distress Paints from Ranger, and Dyan Reaveley's Dylusions Ink Sprays from Ranger. Dan looked to classic paintings from the past for his color inspiration. When I sat down to think about this piece I thought back to art classes in school and how we used to look at classic paintings to learn about composition, lighting and colour, so I thought I'd revisit that and take my inspiration this week from 4 classic paintings. Of course, colour doesn't necessarily mean colourful - the colours in the splatter piece here are just as key as the bright colours in the Mona portrait. Those of you who visit my blog regularly will know that I'm a big fan of Promarkers and use them all the time for adding colour to stamped images. Two of these pieces are Promarkered and the other two use paints and inks. Do you recognise where I've taken my inspirations from? I'll leave you scratching your head on that for a little while longer! 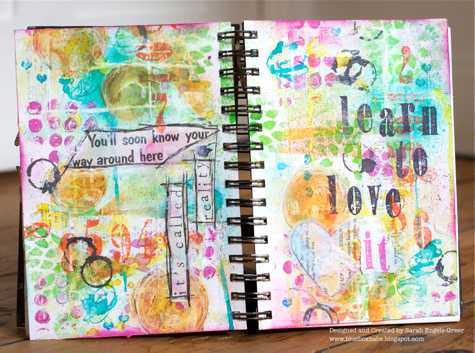 Among the stamp sets I've used here are Mona's Sketchbook, Spring Sprung, Psychedelic Grunge and Spills and Splatters. Anna-Karin enjoys using different colouring mediums and decided to play with a whole bunch of them here to show how you can colour the same image in different ways. I stamped the gorgeous Darkroom Door Country Cottage stamp on different surfaces and coloured it with six different mediums (watercolour paint, coloured pencils, watercolour pencils, alcohol inks, dye inks and Distress Markers). I made eight cards, so this is just one of them. On this card, I stamped the image on glossy cardstock and used the fabulous Colorbox Stylus Tool to colour it. For the backgrounds I used kraft-core cardstock and different texture fades. 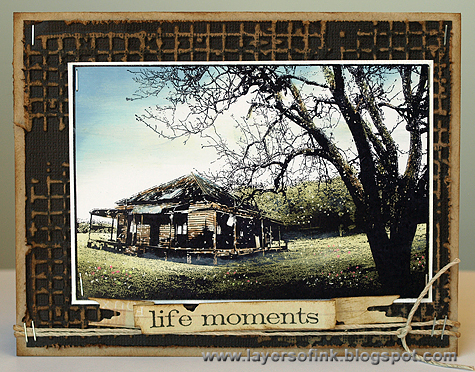 Sentiments from Tim Holtz Simple Sayings were stamped on tattered banners die cut from 7Gypsies ledger paper. My pages are all about reality and learning to love it. Mummy duty and domestic life takes priority these days but I want to learn to embrace the everyday and all it has to offer! Everyday is full of challenges and blessings. I seem to have a thing for circles in my journal as they keep appearing! I went to town with Dylusions Sprays, Color Wash, Distress Paints, Stains and gesso, not to mention stitching, newspaper scraps and journalling pens. A mixed media canvas held Tracy's attention this week, using sprays, kitchen towel, charcoal pencil and more. There are so many colour mediums to use but Dylusions Inks Sprays were my colour choice this week. 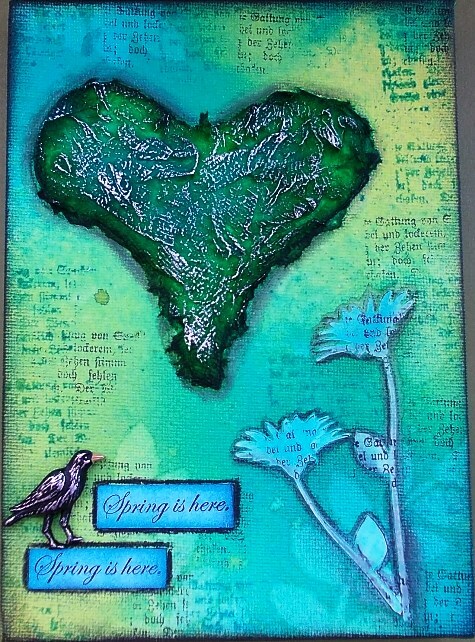 Looks can be deceiving, there are many layers to this project adding into the mix Wendy Vecchi's White Embossing Paste, PaperArtsy Beach Hut Fresco Finish Paint, silver Paint Dabber and a charcoal pencil. When creating these type of pieces I always find it as easy to make two as I do one piece of art, so I have created an extra little piece to give away to inspire our readers too. 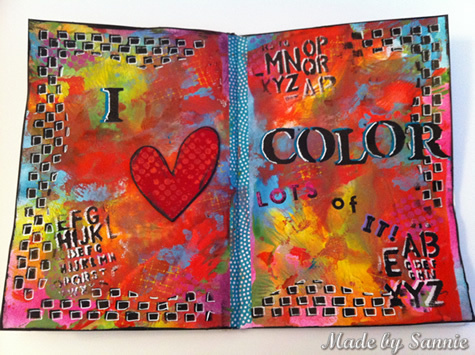 Candy is really showing her love of vibrant color this week with this pocket art journal page and four very artsy and colorful tags. 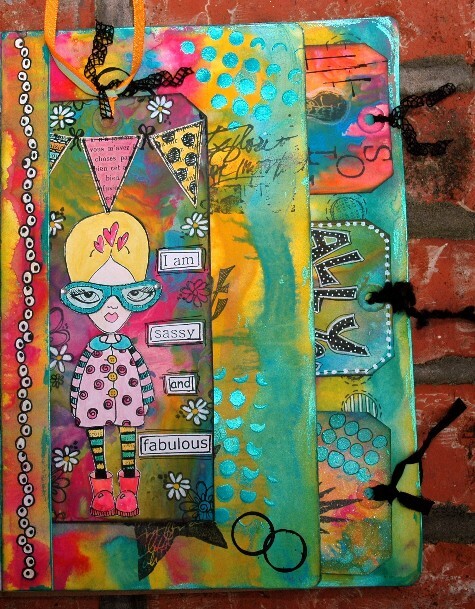 I am in love with Tim Holtz' new Distress Paints! I love the fluidity of these acrylic paints; how they react with water and how they can run and move within the other colors yet retaining their own bright color! For this Art Journal page, I combined Mustard Seed, Picked Raspberry and Broken China Distress Paints to create not only this four pocket journal page but also the four tags. 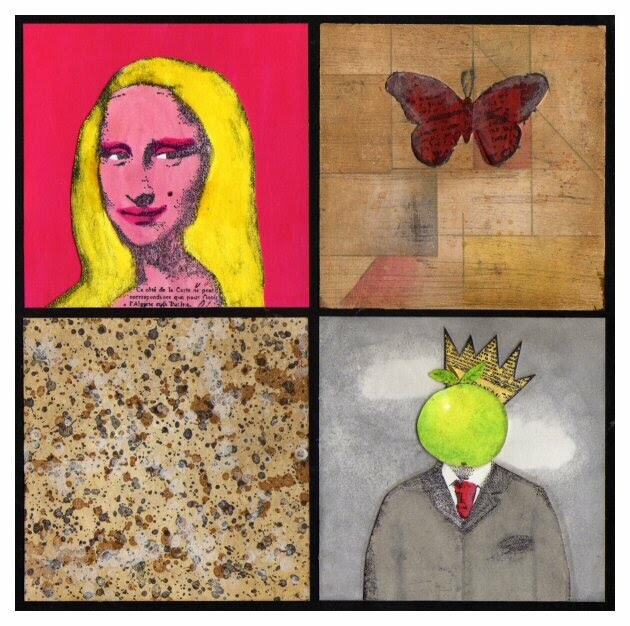 The big #10 Manila Tag is embellished with a combination of images from Dyan Reaveley's wonderful Dylusions Stamps. Before you join in with your color medium(s) of choice - be sure to visit our design team member's blogs for tips, tricks, how-to, and more! You will also find more photos (and full supply lists) for their projects too. As always, Simon Says Stamp is giving away a $50 gift voucher that will go to a random entry chosen by Random Generator. To qualify all you need to do is create a new project that ties in (in any way!) with our theme and post it, along with a link back to this challenge, and add a link here. This challenge will end at 11:59pm on Sunday April 28th EST. There are fabulous examples from the Design-Team. oh my gosh! A lot of AMAZING Aatwork this week here around! BRAVO!!! Oh WOW, the DT has surely outdone themselves this time! AWESOME inspiration! I love love love lots of color and look forward to playing along this week! Great inspiration pieces here. My project for this week's challenge started with an old tin pencil box that I painted and decorate to add just a slight bit of color. I love this challenge because it really helps you to stop and think about the colors you're choosing. Thanks for an inspiring challenge and the inspiring creations to get us started. I really enjoyed this, and am so grateful for anyone who stops by to say hello and take a peek. Such beautiful samples DT! 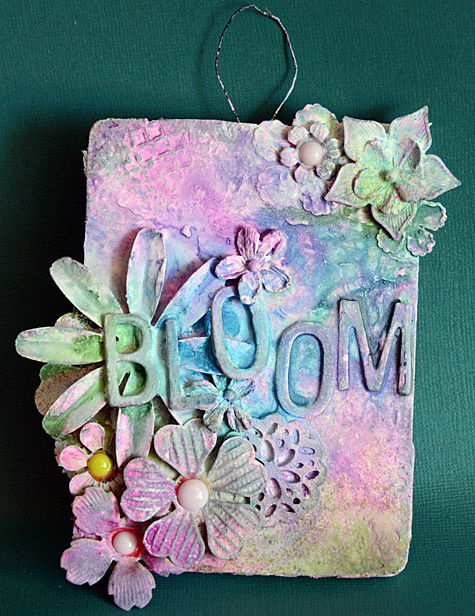 Love the pretty vintage project and the different mixed medias. Thanks for the challenge. The colors on the DT cards are so vibrant and beautiful. Amazing dt inspiration as always. My post did go up on Monday, about 1:30 am uk time, My blogger for some reason says it was posted on Sunday. If this is a problem please delete my entry. Blogger has a time zone all by it's self. Such a wonderful challenge theme and really great inspiration by the DT. Gorgeous work by the DT!! Thanks so much for the challenge! Always awesome design team samples...love them all! Thanks for the "color" challenge. There are so many new products on the market and unique ways to use them. So much fun! Fun challenge!! I'm all about playing with the whole box of crayons ;D Thanks for all of the beautiful DT inspiration! Such inspiring projects from the design team this week. I love color and this challenge was so up my alley. I'm praying that my piece is chosen as top 3. Blessings! What fabulous colourful projects by the DT....absolutely inspirational. The DT team rocked this week! So much to be inspired by! Stunning creations ladies and a great challenge. Fun challenge and fun to see how everyone uses color in their work. Such stunning DT work, as always... and what a fabulous challenge!